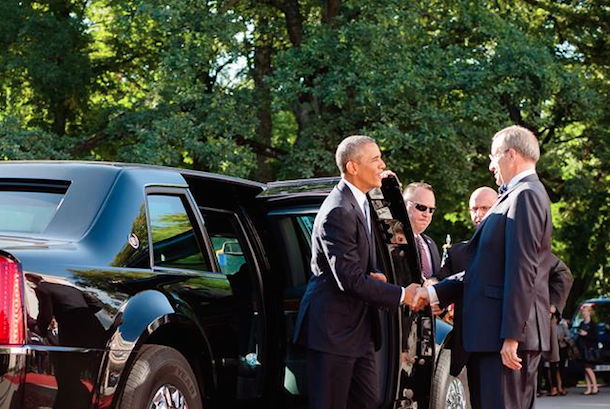 The US President Barack Obama met with Estonian President Toomas Hendrik Ilves, Latvian President Andris Berzins, and Lithuanian President Dalia Grybauskaite in the Estonian capital on 3 September. All the presidents stressed the importance of the mutual collaboration in defence and security matters, and discussed how to help Ukraine in the current crisis. Mr. Obama also gave a speech about Estonia and the situation in Ukraine. In a speech in Tallinn, Obama said the vision of a Europe dedicated to peace and freedom is "threatened by Russia's aggression against Ukraine," but said NATO will not allow that aggression to go unchecked. "We will defend our NATO allies, and that means every ally," he said. "We will be here for Estonia. ... You lost your independence once before. With NATO, you will never lose it again." He added that Russia was "paying a heavy price for its actions," in part through Western sanctions imposed over Ukraine, and that NATO is poised to do more to help Ukraine defend itself. "We will defend our NATO allies—every ally. In this alliance, there are no old members or new members; no senior partners or junior partners—there are just allies, pure and simple. And we will defend the territorial integrity of every single one. Today, more NATO aircraft patrol the skies of the Baltics. More American forces are on the ground—training and rotating through each of the Baltic states. More NATO ships patrol the Black Sea. Tonight, I depart for the NATO Summit in Wales, and I believe our alliance should extend these defensive measures—for as long as necessary. Because the defense of Tallinn and Riga and Vilnius is just as important as the defense of Berlin and Paris and London."